I’ve tried fringes one time too many. The hair kind and the decorative kind. The hair kind I’ll attempt again some day, once I am guaranteed that I will be able to control it myself – but fringes hanging from my clothes, shoe and accessories? No, I don’t think so. Of course as demonstrated by that rather funky bag above, fringes and tassels can look really cool. That’s the thing though, they can look cool – for about a second. Carrie Bradshaw tried out a tassel or two in her time and they rarely worked out. Berger – self-indulgent, intolerant oaf that he was – did not dig her tassel bag (which would have got admiring glances from appreciators of fashion that night but she would never, ever have used again. Not that she ever wore anything twice, Patricia Field saw to that. I digress! ), in fact, it was probably one of the reasons he cruelly broke up with. These shoes suffered a similar fate but instead of Carrie’s boyfriend hating them, it was Miranda’s baby who decided that a good time to force his mother’s waters to break was when Carrie and her new favourite shoes were in the closest proximity that they could be. But she would only have worn them once anyway so that’s ok. 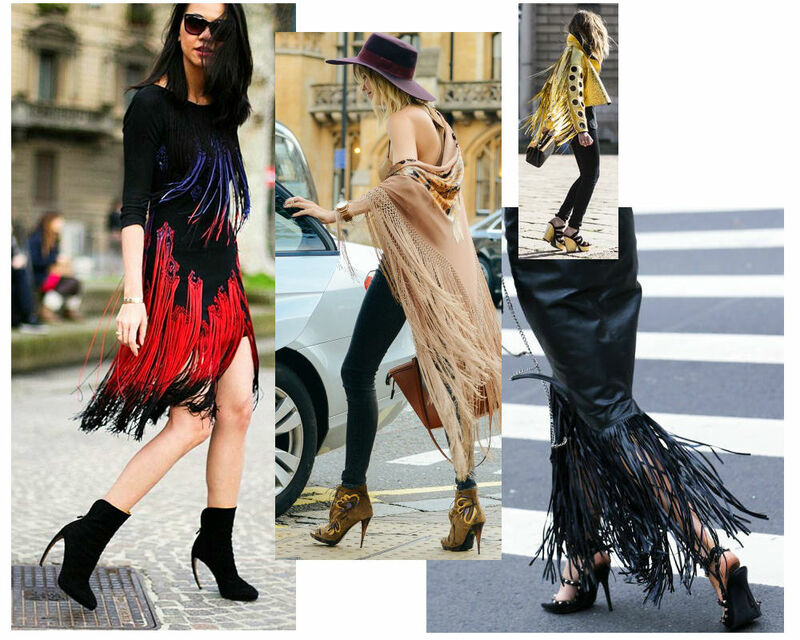 Fringe skirts are a thing at the moment. That’s fine for now but it’s a trend that will date very badly I think. You will see women wearing fringe skirts at Christmas time at the latest but if anyone dons one in 2015 and the fashion police are around, well, they may just be thrown into the style penitentiary. On the sleeves too? No need, no need. The most western of them all! I am not saying I hate fringes or tassels or other bits of material that hang around for decorative purposes. I do admit that there’s a time and a place for them (albeit a limited time and possibly remote place.) Fashion is a fickle mistress. In the words of Heidi Klum, ‘One minute you’re in and the next you’re out’ (or something like that) and for some weird reason fringes come in and out all the time. Maybe it’s because they are easy to do and make an instant statement, which in fairness is a good enough reason. Good but easy. They were all over the streets during the various fashion weeks this autumn and some fringe sporters looked the biz. Just don’t go copying their looks. That was then – the fringe will not be of benefit if you want to look current or original.